Andy Coolquitt was born in Texas in 1964, and currently lives in Austin. He is perhaps most widely known for the house which began as his master’s thesis project at University of Texas at Austin in 1994 and continues to the present day. The house is a multifaceted entity, serving as a performance, studio, and domestic space for Coolquitt. In the summer of 2016, Coolquitt produced a multi-exhibition project titled Studio Art………..Period Room while in residence at Artpace in San Antonio, TX. 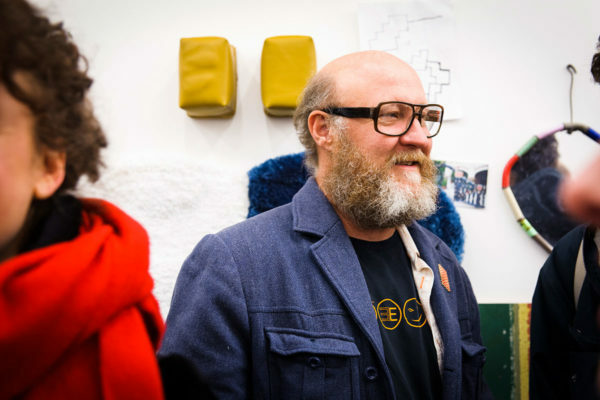 In spring 2014 he was artist-in-residence at the Chianti Foundation in Marfa, TX, which culminated in the exhibition, Multi-Marfa Room, at the Locker Plant in Marfa, TX. Notable solo exhibitions have included This Much at Galerie Krinzinger in Vienna, Austria; no I didn’t go to any museums here I hate museums museums are just stores that charge you to come in there are lots of free museums here but they have names like real stores at Maryam Nassir Zadeh in New York City, NY; attainable excellence at AMOA-Arthouse in Austin, TX; and, most recently, somebody place at Lisa Cooley in Dallas, TX. RSVP here to reserve your spot.